Yang and I were afflicted with strong cases of senioritis. Therefore, we baked. Yay! These mini brown butter, coconut and raspberry cakes are easy and yummy, great if you’re planning to make multiple things in one day. The butter browned pretty quickly. I pulled it out when it was a fairly light brown, because I didn’t want it to burn. Be careful when you’re browning it, since it goes from sun-kissed tan to ashy faster than you can get out your bathing suit so you can swim in said butter. I didn’t sift the sugar or flour; too much work. These financier-like cakes aren’t perfectly smooth (there’s coconut flakes and bits of raspberry), so it doesn’t matter if the flour is 100% lumpless. Yang put the raspberries in with the opening side up, but I don’t think your consumers will care. I was able to make 31 of these beauties. I ended up baking them for 15 minutes, at which point the tops were nice and browned and crusty. I could have baked them for longer, but was afraid of making the insides too dry. They stuck a bit to the pan, despite Yang’s expert greasing. We, along with Cleopatra, who showed up with five minutes left on the oven timer, used plastic forks to coax them out. I was the first to reach for one, less than a minute after all the cakes were resting on a wire rack, but everyone else followed suit immediately. They were super buttery, and they smelled of the most nutty brown butter. Despite the low ratio of almond meal, they were pleasantly almondy throughout, with plenty of coconut streaking here and there. The tartness of the raspberry added a pop of juice and tartness that cut through the richness of the rest of the bite. I loved how the soft fruit played against the other chewiness present. 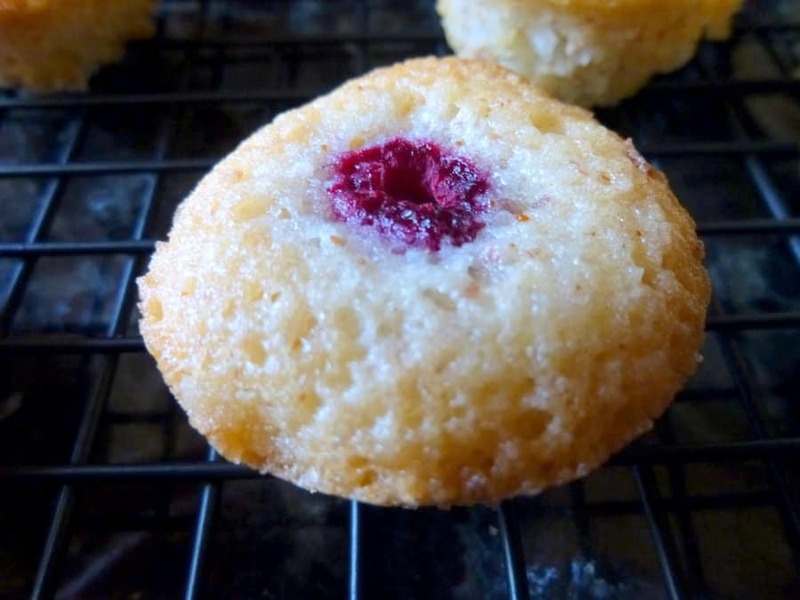 These mini brown butter, coconut and raspberry cakes were super easy and yummy. I loved that you could use frozen raspberries, since I believe that cooking fresh fruit is a total waste if it’s delicious (unless you have a glut; in that case, call me and I will take it off your hands for free! Deal’s off if it’s papaya). If you don’t want to do another pot, you can get away with plain melted butter instead of melted butter. It won’t have that same complex nutty unctuousness, but I guarantee it will still be dang delicious. Make brown butter (Google a tutorial if you need help). Mix the almond meal, coconut, sugar, flour and baking powder in a medium bowl. Add the egg whites and mix. Add the butter and mix until combined. Divide between 12 well-greased mini cupcake wells. Place 1 raspberry in the middle of each cake. Bake at 350F for 12-15 minutes or until cakes are golden, springy to the touch and moist in the center.